It has been 10 years since the last sequel to Barry Sonenfeld’s alien classic and did that one fall short. 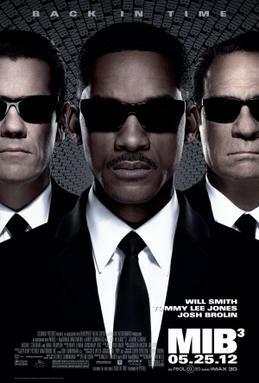 The problem with Men In Black II was how it borrowed too much from its predecessor and played things way too safe. The plot was uninspiriing and served as an excuse to bring Tommy Lee Jones back rather than go into a different direction. Now, we have the third entry and to be fair, I didn’t expect it to be that good. Despite the many infamous addresses in the reshoots and rewrites, the question remains is was this movie worth the wait? On one hand, its a enjoyable romp that surpasses the damage that was done in Men in Black II. The humor is well-balanced, the aliens are creativly designed, the sets are great, and even there is rarly a character I disliked. On the other, it lies in the heavy amount of digital work and structure among the sequels. To be fair, it’s a good movie but one that questions if it needed to exist. With another installment, that means continuity is established and thus one has to sadly accept the second film’s existance. At times, I wanted it to feel like a stand-alone picture, but considering how the first ended, there is no way to bypass the element of how Agent K returns to the MIB agency. With that aside, there are a few odd moments, but they exist only in the film’s climax and can either be brushed over or go unignored for those who don’t shake off small things like the basic rules of time travel. The world of film making has changed a lot as digital effects have come a long way. But it doesn’t get the point where its too obvious to point out an obvious man in prostetics and a full rendered creature. Even certain set pieces are obviously computer and blue screen work, but it doesn’t detract from the enjoyment. There is something to admire as long as it gets cleverly blended in. Given the massive price tag that was used for the production budget, it shows as things like J jumping through different aspects of history are not an easy effect to pull off. In short, its creative at times but a little over-excessive. Looking pass that, there is a lot to off. The villian Boris is unique to watch and even when we compare to the 1960s version that looks like a mix between a Hell’s Angel biker and something from The Devil’s Rejects. When the past does meet up with the future self, its a hilarious moment to see future Boris commentating on how easily flawed he was. Even moments between J and young K are a treat to see how the two don’t differ and yet the younger version dejects to doing such in the future. If that wasnt’ enough, we get a few new characters that are neither annoying and are well-developed. Such is the character of Griffen, an alien that has the ability to see forward into the future and look into the many different paths one can take while prophetcizing what is to come. What works with Griffin is how innocent he is to the world; acting like a child that says he knows better and yet the irony is that he does. Even when he looks into the negative ways of the future, he remains optimistic about it knowing that something better will come along. Last year, I saw X-Men First Class and I was not impressed with out the 1960s was presented. Personally, I saw it as a situation where the film fits the decade. For example, Watchman is set in the 1980s and that works because of the anarchey and vigilante tone that is present and how it relates to the rebellious feel of the era. With MIB3, the amount of quirk and camp works well. Not just because its set in a time where aliens were big in the pop culture, but the absurdity of the film connects with the era and they nail the look and feel of the decade very well. Indeed, something better has happened. We are given a story that has one or two holes but are greeted with great visuals and good characters of old and new. What I like is how it connects with the running theme of how big things come in small packages while presenting how little of the universe we know around us and satirizing on own view of daily life. MIB 3 utilizes this as well but to go into detail would give too much away. If you feel scared and pained over what MIB 2 did, chances are you will find yourself at peace…unless you are the type of person that is not big on sequels, but at least some cracks are repaired in the process. “Avengers” surpass many; ’nuff said. Its worth a watch. ’nuff said. What can’t be said that already has been said about a summer film that has gotten massive accliam and let alone deserves it? This is a movie many have been waiting and hyped to see. In the end, it all pays off with a 40 minute finale of explosions and well-crafted fight scenes. The Avengers as a whole is what many summer films have been missing out on. There is a great amount of effort and care placed into the wiriting and staging of notable moments when Iron Man is arguing with Captain America or when Loki sets a massive army from another dimension onto the city. Ever scene is well delivered and it comes together rather well. The plot is simple but packs quite a lot. A Norse god named Loki wants to take over the world with a mystical device and an alien army from another dimension. Nick Furry, Agent of SHIELD (Samuel L. Jackson) steps in and summons a group of superheros (Iron Man, Captain America, Hulk, Thor, Black Widow and Hawkeye) to prevent it from happening. It sounds simple on paper, but as things progress, it gets complex. We go from a simple situation and then it snowballs into a massive battle. The entertainment vaule is never dragged or diminished. Another big thing to look out for is the interaction between everyone while keeping them in character. Iron Man teases about while Cap tries to reason despite being in another time. Even Mark Ruffalo as Bruce Banner is perfect in the mix as he tries to maintain his anger. What makes this group intersting is how they each have a weakness and manage to get it accomplished in the long end. At times they clash but like a family manage to straighten up and realize how importatant they are to one another. What Avengers proves is that the box-office summer is alive and well. In a world like today where people follow on a director’s style, one must sit back and think about formulating their own forumla and delievery. This is where I feel the reason Battleship failed as The Avengers clicked with its viewers. Battleship was following in the footsteps of big and loud movies like Transformers rather than do somehting different. The Avegners is certainly a nearly flawless effort that I would certainly say is the best I’ve seen this summer.